The 1969-1975 issue, unlike the previous Bank of Canada issues, does not have a common date for all denominations. The issue dates span the years 1969-1975. Termination of the 1954 issue was necessary for two reasons. Almost all prefix letter combinations have been used up, and counterfeiting was rampant, particularly affecting the intermediate and higher denominations. Advanced security features were incorporated into the new multicolour issue. These were quite successful, and there was little counterfeiting during the period these notes were being issued. The $1000 denomination was not included in this issue. The traditional promise "will pay to the bearer on demand" was finally replaced by the words "this note is legal tender", reflecting the fact that government paper currency had long since ceased to be redeemable in gold. The 1973 $1 note was perhaps the most-known retired note that Canada has seen. It seems that everybody remembers the $1 note, either having received them every Christmas or birthday from their grandparents, or simply because they were the most common banknote in circulation at the time. Before the $1 note was officially retired, almost 4 billion $1 notes had been printed. Many millions of these notes still exist today. The reverse of the $1 note features a view of Parliament Hill from across the Ottawa river. The reverse of the 1974 $2 note features an inuit hunting scene on Baffin Island in what is now Nunuvut. Just more than 1 billion $2 notes were printed before the Birds Series notes were introduced in 1986. The 1972 $5 note features Sir Wilfrid Laurier on the right side of the face and on the reverse is a salmon seiner in Johnston Strait off Vancouver Island. Slightly more than 450 million 1972 $5 notes were produced before the change to the 1979 $5 shown below. The second-most abundant note, the 1971 $10 note, features an industrial scene from Sarnia, Ontario, on the reverse. Sir John A. Macdonald, the first prime minister of Canada is on the front of the note. Over 1.5 billion $10 notes were printed between 1971 and 1989 when the Birds series $10 note was released. The 1969 $20 note features Queen Elizabeth II on the front and a view of Moraine Lake, Alberta on the reverse. Before it was replaced in 1979, just less than 500 million 1969 series $20 notes were printed and released for circulation. The $1 may be the most common and well-known, but the 1975 $50 note is not to be outdone in a popularity contest. The reverse features the colourful Royal Canadian Mounted Police Musical Ride dome formation while William Lyon Mackenzie King appears on the front of the note. Approximately 175 million 1975 $50 notes were issued. The last note in the series is the 1975 $100 note. Sir Robert L. Borden, prime minister during World War I, appears on the front of this note, with a view of Lunenburg Harbour, Nova Scotia, on the reverse. Roughly 156.7 million $100 notes were printed between 1975 and 1988 when the Birds Series $100 note was issued. The method of numbering the $5 and $20 notes was changed to a format which would be machine-readable. The red and blue serial numbers were removed from the note faces and replaced by black numbers printed on the reverse. The "BANK OF CANADA - BANQUE DU CANADA" inscription on the reverse was removed to provide a white background for the numbers. The previous $5 and $20 multicolour notes were not withdrawn but permitted to wear out in circulation. Additional changes were made on the $20 note in response to the criticism that it was not sufficiently different from the $1 note to prevent confusion. The counters in the corners were clarified and strengthened, and the green tones of the face were reduced while the orange and pink tones were enhanced to increase the colour contrast between the $20 and the $1. 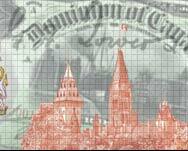 It was planned to convert all the notes eventually to the black serial number format. That plan was abandoned when events overtook the change and a new series was designed to keep pace with banknote printing technology. The 1979 $5 note was a short-lived issue because only 7 years later, the Birds series 1986 $5 note was released. Almost 590 million 1979 $5 notes were issued during the 7 years they were around. The $20 note was extensively modified as described above. The new note is much easier to quickly identify than its predecessor. Being a heavily-used denomination, the 1979 $20 note had a printing of approximately 2.6 billion notes between 1979 and 1991.